A friend asked me about Canada Blooms, “Is it good this year?” And I replied, “There are ideas worth stealing, so that’s reason enough to go.” It is. Many of those ideas make better experiences than photographs, like this exhibit from Jardins de Métis/Reford Gardens in Québec. Reford’s gardens are typically conceptual. 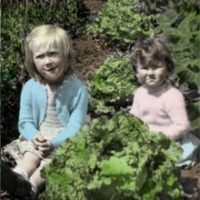 Remember the blue stick garden? 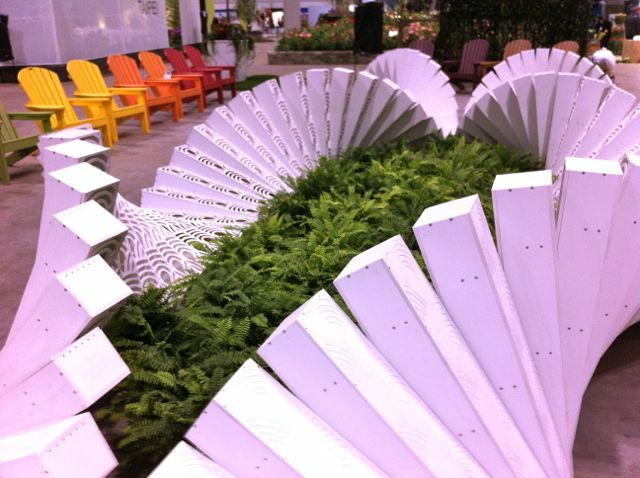 This one is from their International Garden Festival designed by asensio_mah and students at Harvard’s Graduate School of Design. The reaction to a Reford installation ranges from “I want to marry them and bear all their children” (that would be me) to “Huh?”(many mainstream gardeners, if my tour guide experience is to be trusted). The plastic boxes with cut-outs on one side (the more horizontal ones housing living moss) undulate down the space in a way that must be seen and sensed in person. Here are some other reasons to visit. Landscape architect Victoria Taylor designed it; Ecoman contractor Jonas Spring built it, using chunks of waste concrete – and judges awarded it for creativity. It’s a metaphor, Victoria told me, for the inspiration that emerges from between the cracks. 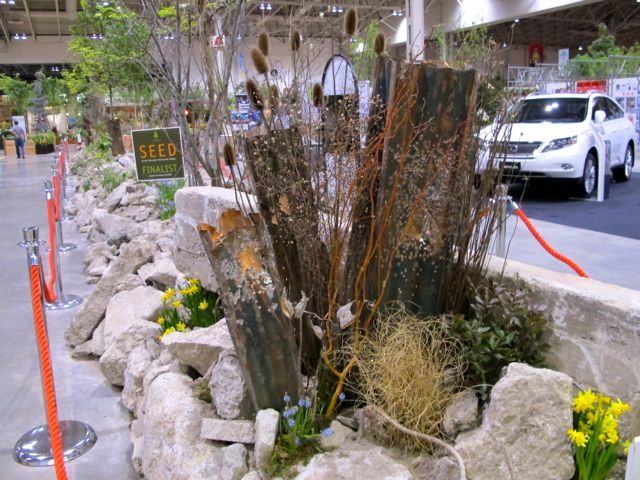 It’s also a pretty cool idea for a scree garden. Believe me, in real life it’s more compelling. Those pillar-like light fixtures are old metal roofing, blasted full of buckshot holes. Wow. Also, I have an enduring fondness for teasel. 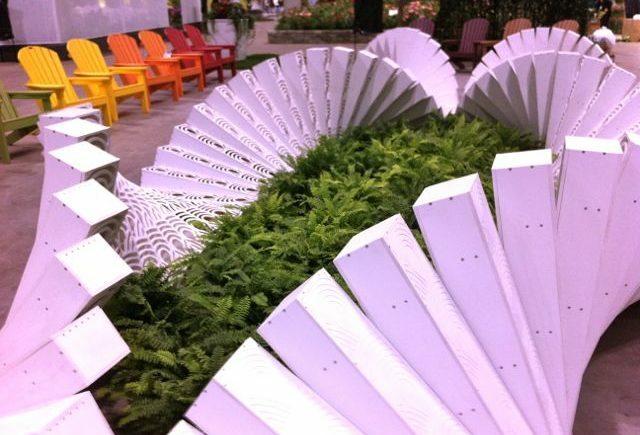 Ronald Holbrook’s design for Canada Blooms’ first international garden, from Taipei, Taiwan. 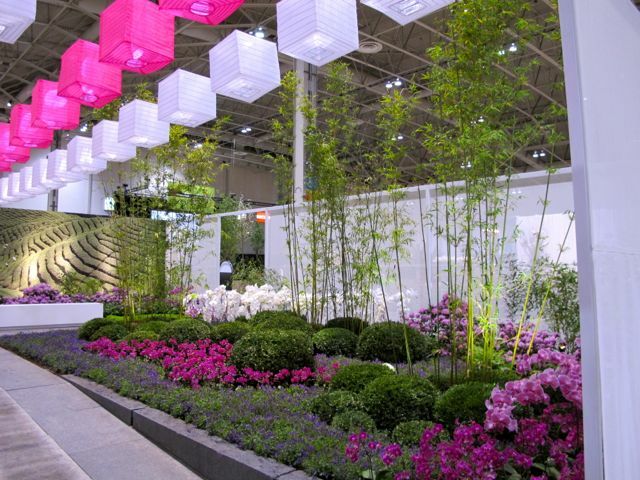 It’s a grand garden, more in the tradition of Canada Blooms show gardens of yore, and it positively levitates with orchids. Those cloud-form box thingies – there must be a better term for this massing than hedges – are a lust-afterable trend. The Juno artist gardens are back, and this one for Feist has to be the most photogenic garden. It really does not have a bad angle. I selected this shot for the blog, simply because it shows the forced lilacs blooming. There are more, and perhaps better ones, if you ask. 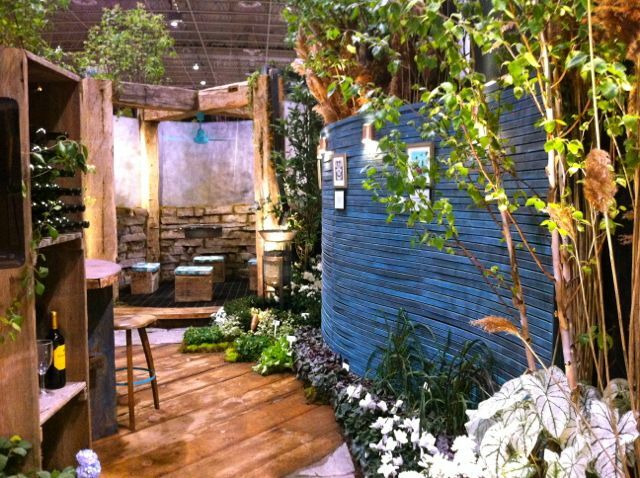 Recycled, repurposed materials continues as a garden trend. Among my favourite recyclees at the show are the leaping deer fashioned from old car parts by former engineer turned sculptor Kam Ko. 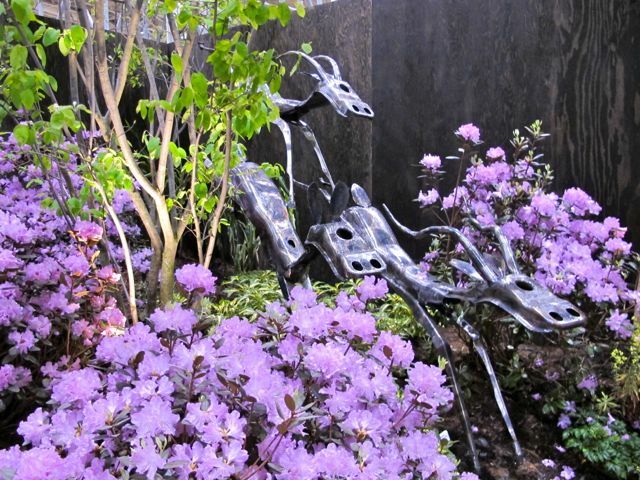 Different sculptors are liberally featured in Parklane’s garden, one of the few large gardens in the show. In fact, Parklane won in its category. An award-winner in the Juno Gardens by The Great Garden Revival Company for Sarah Slean and Royal Wood. Old barn beams were repurposed into that circular pergola and wide plank decking. Wish I had a better shot of the glass suspended table, but this was an emergency iPhone shot, and the space was crammed with media just about every time I returned. 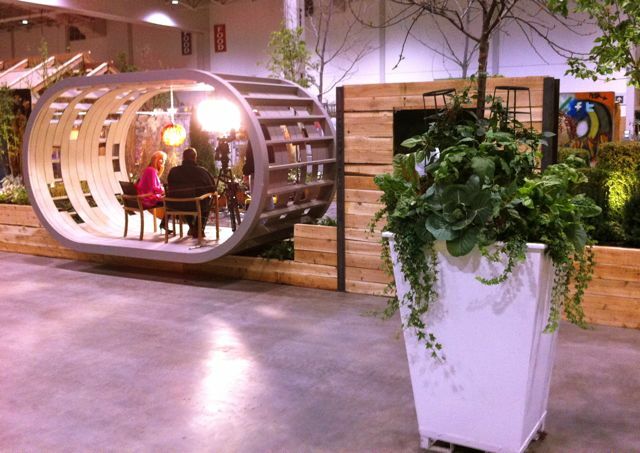 Lest you think it’s all about recycling, here are two things that don’t involve old wood: the cosy oval I’ll call a deckola – combination deck and pergola – by Oriole Landscaping. On Thursday night, it was a favorite spot for media interviews, such as this one by Global TV’s Susan Hay. Beside it a planter composed almost completely of edibles. Of course, masses of forced bulbs and flowers is what it’s all about, isn’t it. Especially as most years don’t deliver today’s California weather. 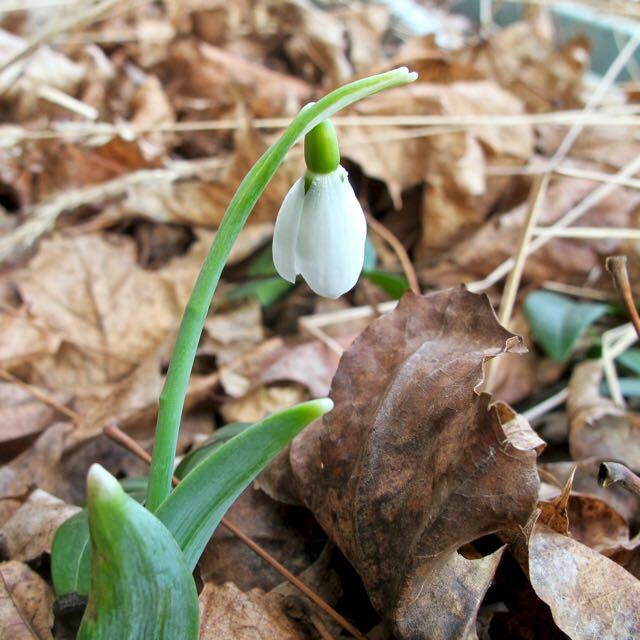 The quick shot of spring is why we call it Canada Blooms, the antidote to Canada Glooms. 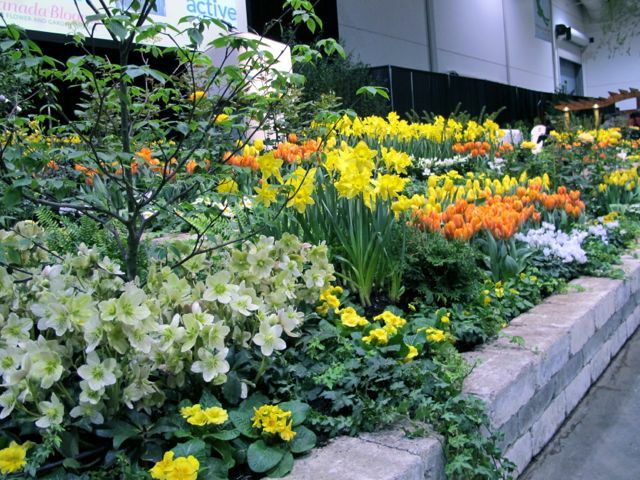 Great pictures of the garden/flower show, thanks for taking us along! That Reford installation is, um, interesting. Actually, I have a feeling I would like it in person. I really love those leaping deer! Thanks, Alison. I love the leaping deer, too. Though having looked at them more closely, I think they're meant to be gazelles. Anyway, cute as leaping buttons, whatever they are. Thanks, Lou-Ann. And thank you for dropping by. Oooh, so wish I could be there in person, but thanks for the photos, next best thing. Deborah, I wish you could be here in person, too. I'd love to get together next time you're in Toronto. Is't that cool? I didn't actually give the name: Concrete Bloom Bursts. Victoria's notes from the program say, "The most creative moments in our culture unexpectedly and courageously push through the cracks of society. We draw inspiration from this beauty and admire its resilience." So pleased to see the photos and your comments. Seriously considered going this year as I have not gone in quite a while…so delighted, to see your post. Thank you. Bren, if you come to Toronto, please let us know. 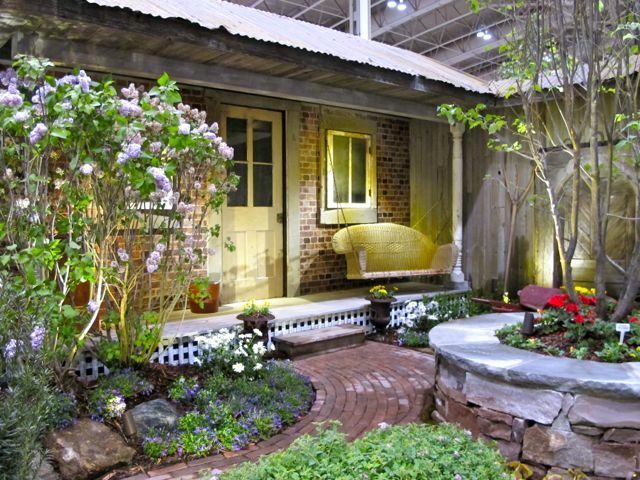 Beautiful gardening, placing of flowers, cabin and lights all are making the place romantic. I have to admit i was a bit put off by the cyclamen in the beds in the Juno garden. Not a very practicle bedding plant to be sure. Absolutely dissappointed this year..cheaply done, cost cutting for sure..no ideas..most plants were spent when we went through….just cant say enough how sad I was to see this set up..I go every year and anyone I have spoke with…will never drive the 2 hours to go again…….Disgusting!!!!!!!!!!!!!!! !..Hate to be anonymous, My name is Tracey Cronkright!!!! Wonderful blog, Helen! And of course, there's your fabulous photography. Lovely images. That picture ?? oh my, i wish i'd live in such an environnement. Question. Why Sarah Slean and Royal Wood? I know both these bands but i wonder why are they related to that festival? Thank you!